This activity is designed to give student the opportunities to explore addition fact family sets from 1 – 10. 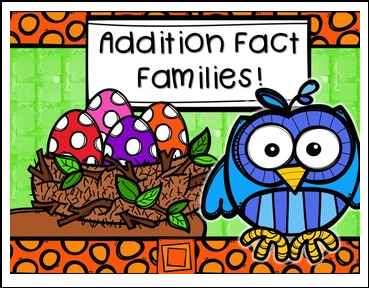 This cute owl activity is an ideal way for students to practice their basic number facts. Owl Nest Player Cards (1-10), 2 Sets of Egg Number Cards, 1 Nest Ten Frame & Egg Counter Cards. Place the Owl Nest Cards & Egg Number Cards on the table. Players choose a nest. They find two egg cards that they can add together to make the number on the nest. They record their number work on the recording sheet. Students record 5 fact family nests. Give each player a Nest Ten Frame and a set of Egg Counter Cards. Place the Owl Nest Cards face down on the table. Students pick an owl nest card. They use the egg counter cards to explore how to make that number on the ten frame – ‘how many red and blue eggs can you add together to make X?’. “I used _____ red and ______ blue eggs’. Students record their fact families on the recording sheet. Students repeat this activity 5 times.